Josie was an orphaned twin. She was born in a huge storm and was not mothered, and as a result was bucket reared. She weaned herself a bit early and I was a worried about making joining weights but she has well truly caught up. By Dajory Dynamic D19 and Dajory Josie A2 she is very much like her mother. 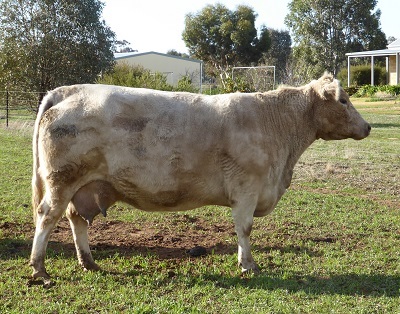 She has consistently produced low birthweight calves with good growth and positive fats. This graph is based on July 2018 update. Click here to view most recent Breedplan data.